In the early 1950’s a young man by the name of LaVerne “Verne” Donald Meisner began a musical career that has endured for more than four decades. With a style unlike any other, Verne and his son Steve continued to create and perform what’s known as the “Meisner Magic” sound that will endure for generations to come. In this presentation you will be entertained by the raucous, intricate musicianship of the Verne and Steve Meisner Band. You will hear the snappy polkas and dreamy waltzes that have made “Magic” and “Waltz King” synonymous with the Meisner name. Become part of the dance as you witness some of the finest polka dancers in action. 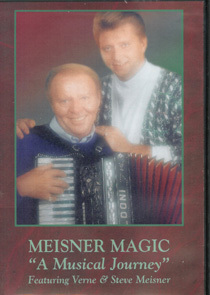 Recorded live at the Riverview Ballroom in Sauk City, Wisconsin, portions of this presentation were viewed on the Wisconsin Public Television as part of a feature program called “Polka from Cuca”. In addition, Verne’s recent inductions into the National Cleveland-Style Polka Hall of Fame, and the International Polka Music Hall of Fame® in Chicago are included. With the help of folklorist Dr. James Leary you will take a brief musical journey through the careers of Verne and Steve Meisner. Interviews and pictorials will bring you up to date on the talented Meisner Magical history.